Remodeling your house or basement can be incredibly exciting but more than a little stressful. The key to minimizing frustration and stress during a house and basement remodel is to hire a reliable contractor. Trapp Electric has been in business for more than 14 years, assisting residential clients achieve the look they have always dreamed of. Don’t wait to give your home a refreshed, modern look. Call Trapp Electric at (309) 444-8188 today and schedule your appointment with one of our experienced contractors today. Some of the most popular shows and videos involve homeowners attempting to remodel homes on their own, without professional assistance. Trapp Electric always warns clients not to attempt a home or basement remodel without the help of a trained and licensed professional. Electrical wiring can be incredibly dangerous if you don’t have the experience necessary to complete it properly. You can put your home in danger of catching fire, or worse, someone getting severely injured or killed by electric shock. You have the vision; we can put it to action. What is their experience with house and basement remodeling? What do past customers have to say about their work? Are they quick to answer questions or concerns? Are they available when I need them to be? After you have answered the above questions, you should have a much better idea on which company to choose. Trapp Electric is dedicated to providing a high level of workmanship on every project, big or small. 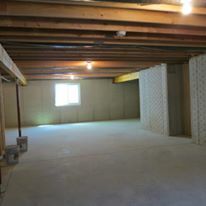 Let us show you why we are one of the most referred companies for house and basement remodels. If you need assistance with your house and basement remodel, Contact Trapp Electric today. Call (309) 444-8188 to schedule your initial appointment today.